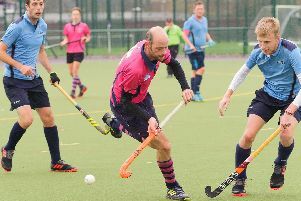 An emphatic 4-1 win for Havant at Isca took them level on points with leaders Olton & West Warwicks in the National League men’s conference west. Mike Deller-Merricks opened the scoring, Jack Stubbings made it two and then Matthew Cox netted the third with Miguel Rodrigues completing the goal tally. Only two games in the division were played due to the cold weather across the country. 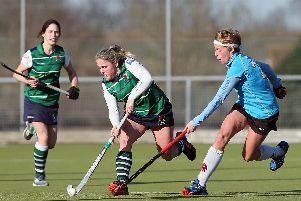 On Saturday Chichester lost 3-2 against Cardiff Met. The only negative of the game for Havant at Isca was a nasty face injury to Bradley Lock after a stick in the face that saw him taken to hospital in an ambulance. He has been released from hospital after 63 stitches and having suffered a fractured cheek bone with nerve damage. Temperatures dropped to minus eight as Havant made their way to the game. They weren’t sure if they would get there and find the match had to be postponed. But on arrival the pitch was virtually clear of snow and with just a couple of patches of frost on the surface so the game went ahead as planned. Havant took some time to get the journey out of their legs and Isca had the upper hand in the early exchanges. But the visitors soon started to get hold of the game with Cox and skipper Craig Duffy taking control of the midfield. Then on 13 minutes Deller-Merricks put Havant in front with a well-taken goal. Having round the keeper he fired into the empty net. Midway through the half Lock suffered his injury and there was a lengthy break while he received treatment on the pitch. Unfortunately he was unable to continue and had a visit to A&E. This seemed to shake his team mates and Isca pushed for an equaliser. Then with the last touch of the half Stubbings doubled Havant’s lead with a deft touch into the goal after some good approach work by Ethan Hoddle. In the second half Isca pushed again to get back into the game, but the Havant defence held firm with Jonathan Pickett and Indy Laly making some key interceptions. Then in the 45th minute Havant extended their lead with Cox finishing well from a penalty corner. Isca replied a well taken penalty stroke to give them some hope of getting back into the game. But Miguel Rodrigues scored the goal of the game with a swift counter and a deft touch to wrap it up at 4-1. With 10 minutes remaining Havant nearly let Isca back into the game. Miguel picked up a yellow card for not retreating from a free hit, he was followed by Jack Stubbings with a green card, and then skipper Craig Duffy also picked up a green card and Havant found themselves down to eight players. Matt Cox and Charlie Stubbings then kept possession between them to play out the two minute suspensions and Havant needed Maciej Pacanowski to make some sharp saves to maintain the lead and seal the 4-1 score.